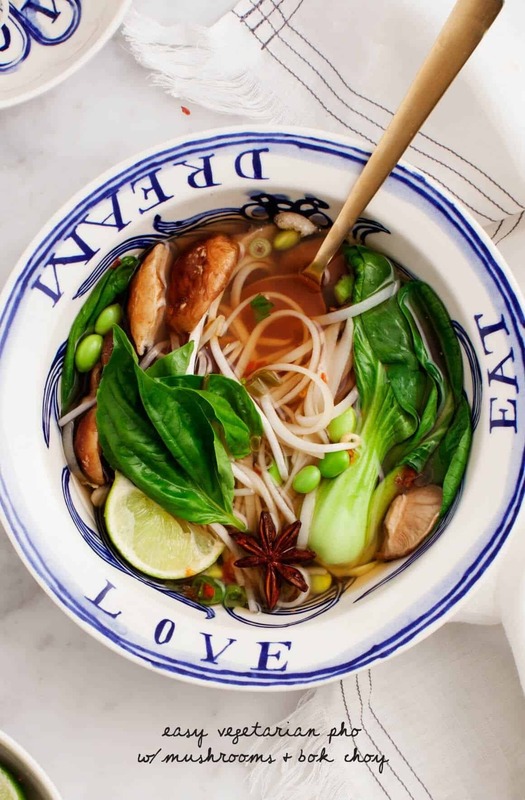 Easy vegetarian pho is a simple take on the classic Vietnamese noodle soup made with spices, shiitakes & bok choy. Weeknight-friendly, vegan, gluten free. There are certain foods that I eat for dinner all the time that never make it here. My favorite thai coconut soup is a 5 minute walk from our house, and a hot slurpy bowl of mushroom pho is a short distance in the opposite direction. Both have been on my “to make some day” list for a long time. Well, friends, some day has arrived, and this recipe was way easier to pull off than I had anticipated. First thing’s first – this is not an authentic pho recipe because (aside from eating a lot of it) I’m not exactly the most experienced in Vietnamese cooking. Also, I’ve simplified things here by skipping a few steps that were in the recipes that I consulted. I would have titled this “faux pho” if Jack had not rolled his eyes and insisted that the name would make for terrible SEO. Authenticity aside, this a deliciously spiced hot bowl of noodles with hearty shiitake mushrooms and tender baby bok choy. A new favorite around here. This recipe makes enough to fill two very large (and very cute) bowls. Double this to serve at least four. For leftovers, double the broth and store it in the fridge. I would suggest adding the bok choy only as you’re ready to reheat and serve in order for it to retain its vibrant color. In a medium pot over low heat, combine the star anise, cinnamon stick, peppercorns, and cloves and stir until fragrant, about 30 seconds. Add the water, onion, garlic, ginger, and the stems of the shiitake mushrooms. Simmer for 20 minutes, then strain and return the liquid back to the pot. Slice the shiitake mushroom caps and add them to the pot along with the tamari, rice vinegar, and scallions. Simmer 15 minutes, then add the bok choy and simmer until tender, about 8 minutes. Taste and adjust seasonings. In a pot of salted boiling water, prepare the noodles according to the package directions, cooking until al dente. Drain and rinse. Ladle pho into 2 bowls over the rice noodles. Serve with the lime slices, sprouts, basil, and chile sauce. I never knew making pho could be so easy! I can’t wait to try this! Haha “faux pho”!! Wouldn’t have that made for an interesting title 😉 Either way, this pho looks delicious! This looks so good, and totally doable! I love that it’s not so complicated. I can almost smell it! Thank you of the faux pho! Pho is one of my faves, but it seems so cumbersome to make at home. Can’t wait to give this a go! Yum! I can’t wait to try this. I fell in love with Vietnamese food in Vietnam a year ago and have since declared it my absolute favorite. Seriously…a trip to Vietnam is worth it for the food alone! Pho is a long and tedious dish to make at home so I’d love to try this version. It might not be exactly the same but I’m sure it will be delish!! It’s on our travel bucket list – hopefully one day soon! Just read through the instructions – can I double check that the onion, ginger, garlic, and shiitake stems are to be discarded when the liquid is re-added (presumably because it’s infused and doesn’t need intensifying further)? Thank you, and thank you for such a lovely recipe! P.S. Caught your cookbook advert (v. clever placement!!) out the corner of my eye and cannot wait to get my hands on it when it’s released! Yes, exactly – those flavors just get infused into the broth. Ha, thanks – hope you like the book! 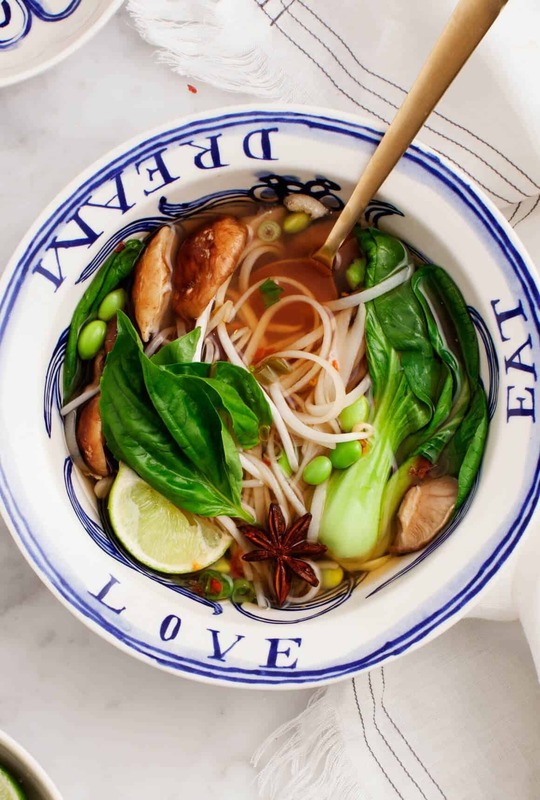 I haven’t jumped on the pho wagon, but this looks delicious! I should give it a try! Recipe looks great! Also love those bowls!!! Where can I find those??? I laughed at the “faux pho” part 🙂 Looks absolutely delicious! My mouth is watering! No Vietnamese restaurants around here, so I’ll have to make it myself. And you have exactly my sentiments when it comes to recipes–read a bunch, then say, how can I make this simpler? I’ll try this tonight! I love it’s faux-ness 😉 it makes it seem that much more approachable to make, and sounds/looks authentic to me! I love making my favorite restaurant dishes at home, its always so rewarding and inspiring to conquer. Way to go 😉 and those bowls – the cutest. Pheels like a Pho-kinda day in Rochester, NY. Authentic or not, these looks so good. I make so many dishes that don’t end up on my blog either. Need to change that! Thank you so much for sharing! My father has decided that he is going to take a vegetarian approach to his diet (in hopes it will help him since he has Hepatitis C). As a result, he has turned to me for help in finding things he will enjoy. Thank you for giving me a go-to recipe that even my dad can handle! All the color and vibrancy alone has me falling for this LOVELY bowl of faux pho. <- HA btw. Definitely like your shortcut version and cant wait to try!!! I love the blue and white bowls as well as the recipe, can you please share information about them? I’d love to find some for myself. This looks absolutely amazing! I feel like I haven’t been able to get on the Asian soup/noodle bowl bandwagon due to the fact that nearly every kind I have seen in restaurants is made with some kind of pork – definitely going to be giving this recipe a try. Awesome recipe luks simply delicious will try soon I m big fan of urs I hv tried many of your recipes and came out really well. thanks. Hi! This Pho soup looks delicious. I’ll be happy if you posted a recipe for thai coconut soup recipe. I’m long time looking for a good one and cannot find. Thanks. ok thank you – I’ll be sure to post one soon! 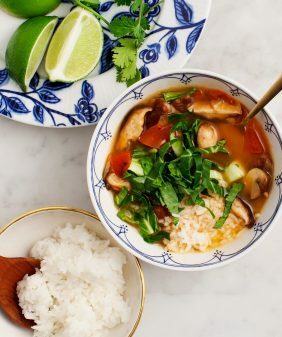 I love this recipe….have been enjoying a lot of soup daily and I was hunting for a good Pho recipe. Found this on pinterest and came straight over and so glad I did. Cant wait to try this. Thanks. Like the recipe, I use vege broth instead, and if you are not vegan I add a porched or boiled egg as a granish. Tried this recipe tonight, the broth came out really well! Adjusted spice levels as needed and used crispy tofu along with other extra veggies! Loved it and will definitely make it again! I agree! I read the comments to see if the recipe is good and what people learned to change/modify. Your photos are wonderful! I’ve never tried vietnamese food but this is getting saved! I had never tasted pho*. This is going to be my first time and hope it tastes good. Images of the recipe are so tempting that I can’t resist myself from trying it. This is so good!!! We had vegetable pho at a vietnamese restaurant yesterday and it wasn’t nearly as good as this. Thank you, for sharing. I made this tonight – with sliced tempeh as my protein. It was a hit! So good! 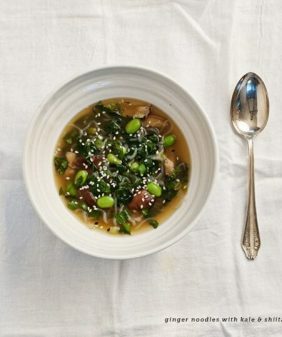 I’m making this now and the broth smells amazing! I through in a chili sliced in half into it. Thank you for posting!!! Oh my goodness I just made this and it is sooo amazingly yummy! I used tofu instead of edamame and added cilantro with the basil, lime and sprouts. Thank you thank you thank you for sharing this yummy recipe now I never have to go out for pho again! This looks amazing! I am adding it to my recipe list! This was so good!! I used the blend of mulling spices they have pre-mixed at Natural Grocers rather than buy the individual spices. I also added some sliced fresh jalapeño as a toping at the end to give it a spicy kick. This recipe is going into a regular rotation. Thank you! I just made this and it will become a regular in my repertoire. My kids LOVED it. I added jalepenos, cilantro and fried tofu as add-ins. I can’t believe how easy it was and how delicious it is! Yay, I’m slo glad your family loved it! Hi! Thanks for sharing this recipe! 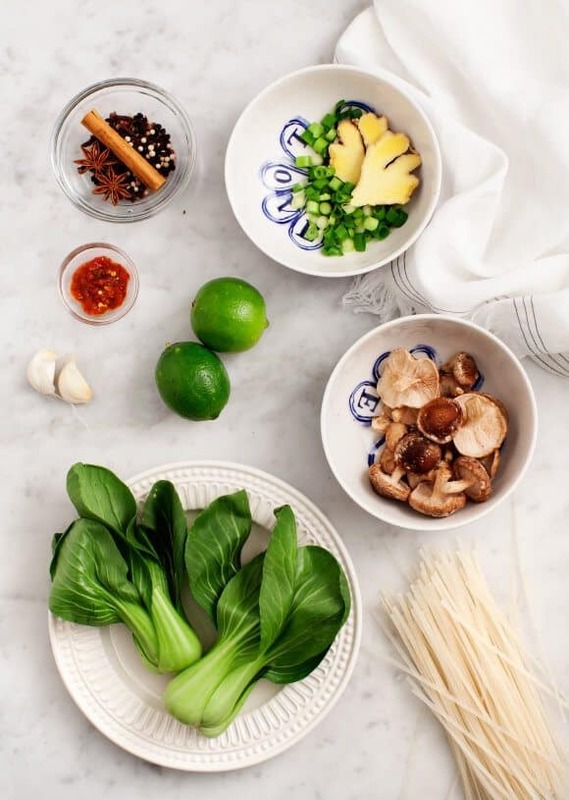 Pho is one of my favorite foods and I am excited to try making it myself. I’m in Austin too, and go to Elizabeth Street way too often- it’s so good!! If you don’t mind, where do you get your Thai coconut soup? Thanks and happy new year! OMG made this!! It was so yummy. yay, I’m so glad you enjoyed it! Just made this! It was delicious! I added a bit of vegetable broth and water, next time I’ll use less tamari. Thank you so much for sharing this! hi Cory, I’m so glad you enjoyed it! Hi Jeanine! If I leftover soba noodles would this work in the soup instead of rice noodles? I do not cook these flavors a lot and was curious. Excited to try this recipe! Yep – just cook the soba separately. I also like to rinse soba noodles after cooking them, it helps them become less gummy. Then add them to the finished soup. I hope you enjoy! oops! Yes at the end, just to warm them in the soup. Jeanine – this was incredible. I appreciate your reply – I put the edamame in at the end and it was perfect. I made this and it smelled perfect. When I tasted it, it seemed very sour. I wasn’t sure if this came from the bok choy or somewhere else? Hi Kelsey, the sourness comes from the vinegar – I personally enjoy this taste but if it’s too much you can reduce or omit the vinegar. (Or if you’ve already added it you could add more water and tamari to temper the taste of it). I hope that helps! Oh My Word! Just made it for lunch! So FREAKING delicious!!!! I added tofu as my protein and added sliced red chilli when I plated it! This is definitely a keeper and will be making this often! Thanks for such an amazing recipe!!! The chunks of onion, garlic, ginger, and mushroom stems get strained out after they simmer in the broth. 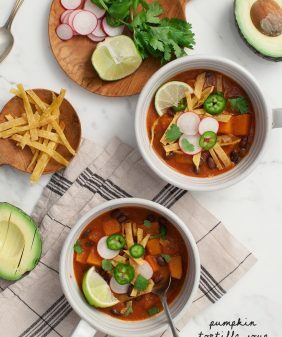 There seems to be a problem with the link to the Creamy White Bean and Tomato soup…when I click on it I get the recipe for the Easy Vegetarian Pho. ??? fixed it – sorry about that! I followed your recipe to the letter and we devoured it! I should have taken your advice and doubled the recipe! Thank you! I’m so happy to hear that!! This looks delicious! I had dried shiitakes I need to use. Can I substitute that for the broth? If so, what quantity would you recommend? Easy, flavourful recipe. Really enjoyed it. Thank you. My wife is from Sai Gon and says the key to pho chai (vegetarian) is in the broth. She makes it from scratch, the best way, and even that seems like an art. The other thing she adds is tofu made especially for soup. The different ways of cooking tofu into tasty meat substitutes is something I never experienced before my marriage. Fresh herbs like Thai basil are crucial as well as lemon squeezed on top. Gotta go, dinner time! I made this today, and obviously something went wrong. With all the simmering, it evaporated down to one small bowl – even after adding a 6th cup of water. (Yes – I made the noodles in a separate pot.) I didn’t like the earthy flavor of the broth – so I’ll omit the mushrooms from the broth next time. But how do I fix this so I end up with more than one bowl? I’d simmer on lower heat, if possible, or a little less time. It should serve two pretty big bowls with all of the vegetables and noodles added. Hey did you forget to add the edamame in the directions? oops! You can drop it in with the bok choy! 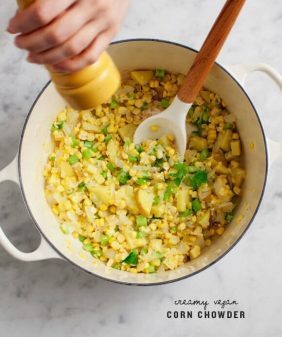 Great veg recipe. I have never tasted pho. I need to try this easy recipe. It seems delicious. Pining it for this weekend. Looks delicious, Can’t wait to try this recipe. I have just tried the recipe and to my taste, it lacks flavor. It probably requires much longer time on to stove, with the aromatics still in the broth. Wow. Pho looking great. I am surely going to try this recipe. Thanks for sharing. 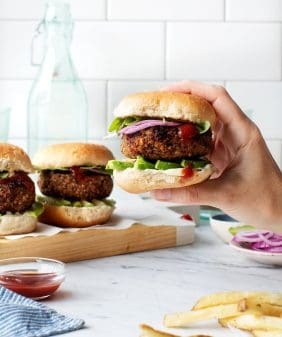 Looks like a lovely recipe as well as quick & easy! Could I just check when you add the edamame? With the mushroom caps? Also if they’re frozen, do they need to be defrostedfirst? oops! Add the edamame near the end with the bok choy. You can let it thaw first or add it frozen, the heat of the soup will thaw it pretty quickly. It doesn’t need to be cooked for very long. I hope that helps! This soup is just awful. I had to use like 3 pans to clean by hand, it tasted really bland in spite of a ton of ingredients and was a ton of fussing around straining broth and boiling noodles separately-who wants to do this? I’m super mad I spent an almost an hour making this. If I wanted a muddy, bland, and fussy soup, I’d drain some gutter water and then dirty 5 pans. I’m sorry you didn’t enjoy this one.